We found a perfect little bream in the middle of the littoral rainforest at our Boulder Beach site last month. Definitely not our usual style of animal encounter – for a moment we thought it’d been raining fish! On closer inspection the little bream had some good size talon scars. More likely it fell from the grasp of one of the resident Brahminy Kites. It’s just one of several animal encounters we’ve had at our Boulder Beach site lately. The previous month we discovered a huge amount of bandicoot diggings, and then there was the time when I had an old fashioned eyeball competition with a Swamp Wallaby. These animal encounters indicate to us, that our littoral rainforest remnant is doing well. It’s particularly inspiring when this is happening at a site which has a somewhat unglorious past. Amongst our group, we each hold a different memory of Boulder Beachs’ past. One is of 3m high sand dunes perched right behind a rocky beach. Another is of bulldozers, trucks and sand mining equipment encroaching on a childhood playground. My memory is from a more recent time, when the punchy smell of Bitou Bush forced me to notice a landscape conquered by environmental weeds. Sand mining at Boulder Beach was in operation during the 1950s and 60s. They were mining the ‘black sands’ for the minerals Zircon and Rutile. Zircon is a hard and durable mineral used in the production of ceramic tiles, and as a lining on blast furnaces in the steel industry. Rutile is used as a whitening pigment in paints and ceramics, and in the production of titanium metals used in aircraft construction. The end of the sand mining era brought about the end of the magnificent dune system at Boulder Beach. 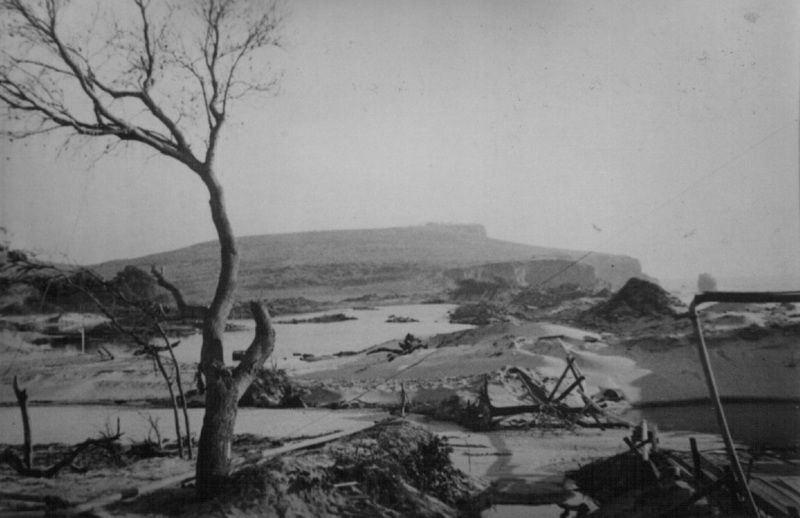 The landscape was flattened and almost barren of vegetation. Soon it was to be smothered by environmental weeds, including Bitou Bush. After initially recommending the planting of Bitou Bush to stabalise sand dunes, governments in the 1990s began coordinating wide-scale Bitou Bush control programs. These programs have been reasonably successful to date. We’ve come a long in the battle against weeds at our Boulder Beach site. I’m very pleased it doesn’t stink of Bitou Bush anymore… it seems the local fauna are pleased about this too. Special thanks for this month’s article goes to Pat Cawley and Malcolm Milner. If you have any local sand mining photos, Lennox Head Heritage Committee would love to hear from you.